The genus Streptocarpus has recently been thoroughly studied with the benefit of DNA tools, and the new analyses have led to some significant changes in our understanding of the genus. All members of Gesneriaceae in Africa are now understood as being quite closely related, and all have been subsumed within Streptocarpus. However, the historical understanding of Streptocarpus as being comprised of two subgenera has been maintained. Subgenus Streptocarpus includes all the stemless species, while subgenus Streptocarpella includes those with a conventional stemmed structure. 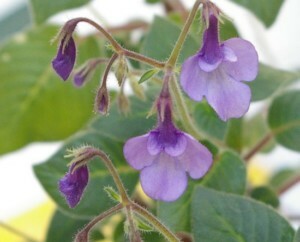 Subgenus Streptocarpella is also understood to include the African Violets, formerly Saintpaulia species, and those are treated separately. The subgenus Streptocarpella consists of a large number of species which can be subdivided into the African and the Madagascan species. The African species are found primarily in Tanzania, Kenya, and in a few other locations in Central and West Africa. The Madagascan species are found exclusively on the large island of Madagascar. In general, the species of subgenus Streptocarpella are found in relatively moist, warm and humid forests. A sampling of African species and their location are as follows. All are known from Tanzania and/or neighboring parts of Kenya, unless otherwise specified. Most of the subgenus Streptocarpella species are not in cultivation. A few are widely available in Africa, Europe and North America as pot and tender garden plants, including S. caulescens, S. kirkii, S. saxorum, S. glandulosissimus and S. hilsenbergii, and a number of hybrids such as S. ‘Concord Blue’. The Madagascan species S. mandrerensis, S. beampingaratrensis and its subspecies and S. andohahelensis have short internodes between leaves and have a particular vegetative resemblance to Saintpaulia. Although genetic analysis has shown that they are not particularly closely related to Saintpaulia, they have been shown to be closely related to each other, and are placed together in Section Parasaintpaulia of the subgenus.